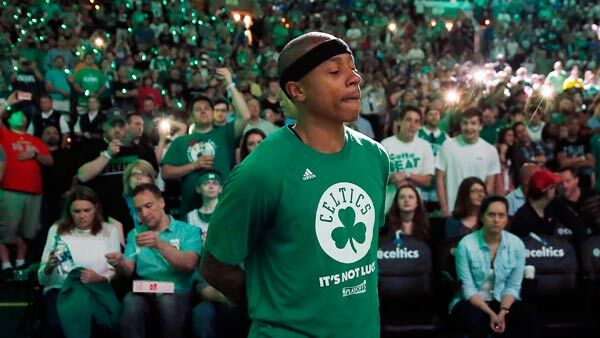 BOSTON -- Isaiah Thomas took the floor to a deafening cheer for the Boston Celtics' playoff opener against the Chicago Bulls on Sunday night, just a day after his sister was killed in a car accident. It was part of an emotional night for All-Star point guard who had 33-point, six assists and five rebounds in a 106-102 Game 1 loss to the Bulls. The Celtics held a pregame moment of silence for Chyna Thomas, who died early Saturday in a one-car interstate accident in their home state of Washington. She was 22. Thomas was informed of her death following the team's practice Saturday afternoon. It was unclear if he'd play Sunday, and prior to the game TNT's cameras captured teammate Avery Bradley comforting Thomas on the bench during the pregame shootaround. But Thomas led the team out of the tunnel when Boston took the floor for pregame warmups. He looked toward the rafters just before the tip-off. On his shoes were written several messages, including "Chyna," ''RIP Lil Sis" and "I love you." Thomas did not address the media afterward, but his teammates said emotion tailed him throughout the day. "It says a lot. Isaiah, to me, is like family," Bradley said. "We grew up in the same area. I know it's tough for him. It says a lot about him. He's a true competitor and tonight he was playing for his sister and he was playing for his family." Condolences have poured in from around the league, from NBA Commissioner Adam Silver and various players and friends. Thomas, in his sixth season, grew up in Tacoma, Washington, and starred at the University of Washington. Golden State's Kevin Durant talked about Thomas after the Warriors' Game 1 victory over Portland. "We're all praying for him, the NBA family's behind him," Durant said. Coach Brad Stevens said Thomas was "struggling" prior to the game, and it showed early as he uncharacteristically missed his first free throw attempt short off the front rim. But how he was able to lock in down the stretch was no surprise to his coach. "He was incredible," Stevens said. "He's an amazing player, amazing person. And days won't get any easier for him, but he somehow plays like that." He said Thomas has freedom to do "whatever he needs to do" as related to his sister and family. Stevens said the decisions on his availability are Thomas' alone. "Those've got to come on his own time, and then we'll adjust accordingly," he said. Al Horford was one of the players that helped pick up the slack when Thomas came out a little flat, finishing with 19 points, eight assists and seven rebounds. While he said they're "never going to make excuses," he acknowledged that it was a tough night on everyone in Boston's locker room. "This is hard," he said. "This was difficult, and I felt like our guys really dealt with it best. We knew (Thomas) was hurting...we have a lot of respect for him that he was able to come out." The Bulls were among the first NBA teams to release a statement of condolence for Thomas on Saturday. Butler, who played alongside Thomas on the past two Eastern Conference All-Star teams, said he also was in awe of what Thomas was able to do. "He's a hell of a player," Butler said. "It just goes to show the type of player and man he is to go out there and battle through what he was going through for his organization and team."